Three fresh running finds we’ve “fallen” in love with. See what we did there? Yeah, it’s fall. And we love it. Especially for running. And here are three new pieces we’ve tried from Brooks Running (remember: we’re an ambassador, so we got to try these on the Brooks house although all opinions and bad puns are independently ours). 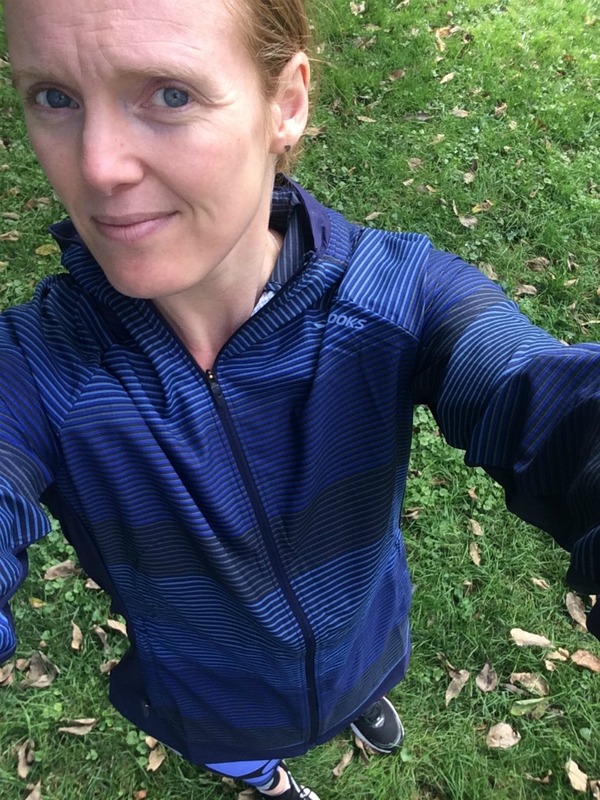 Why Jenn loves it: Besides the thumbholes and light material that is quiet (this jacket is nothing like the athletic pants of the 90s that were all like swish-swish-swish as you walked … anywhere), I love the zippers on this one. Zippers that stick or catch annoy the ever loving you-know-what out of me. And these zippers are so smooth they practically glide. Totally pet-peeve free! Why Kristen loves it: Being able to pack a jacket into its own pocket isn’t entirely revolutionary — but providing a simple, comfortable way to carry that small package around? It’s everything. Here in Florida, it’s rare that I need a jacket for a full run, so having an easy way to transport it so I can wear it at the start (and then maybe pull it back on afterward when I go meet a friend for coffee) is the best thing ever. EVER. This is our second time trying the Ghost Crop and although it’s in a different pattern, all the things we love about our first pair ring true for this pair. These are so lightweight and breathable that they almost feel like a second skin — they are definitely lighter than any other tight we’ve worn and feel great on. Why Jenn loves it: Not to, like, be totally self-absorbed, but the first time I wore these, I got FIVE separate compliments from five separate people — many of which I didn’t know and literally just stopped me on the street. So, I think that’s saying something, right? Right. The Levitate utilizes groundbreaking technology in its signature midsole to enhance energy return — and you don’t have to be an elite runner to notice. This shoe went through nine rounds of development, seven rounds of wear tests, and was worn during thousands of trial runs before it came to market in its current form. The release of this shoe was a big deal for Brooks — we actually got to take part in a Google Hangout with some of the employees and athletes involved in the creation of it — and we’re pretty psyched to see it living up to the hype. 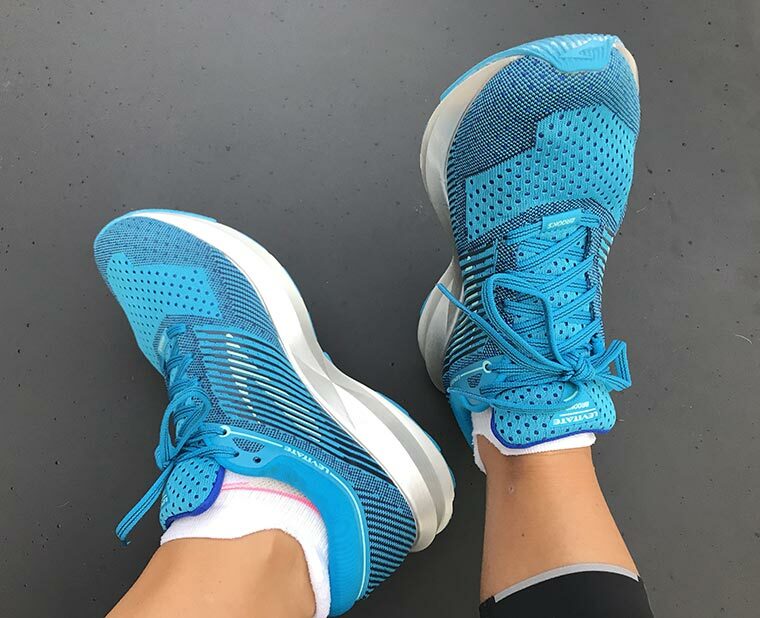 Why Jenn loves it: I’ve run in A LOT of Brooks shoes, and I have to say, straight out of the box, from the first run, these wowed me. They feel PERFECT. For shorter distances … longer ones … they’re light and springy and feel like they were made just for me. Seriously, the one time I won’t wear these running is if it’s raining. Because, who wants to get such pretty shoes dirty? Hehe. Why Kristen loves it: The big deal, to me (and to a lot of runners, from the buzz I’ve heard), is the cushioning. It’s made of a brand new material that distributes the energy you put into it back up into your run — so, instead of the material in the sole springing out in every direction, it sends that energy right back at you, putting a legitimately new spring in your step. However, all that cushion doesn’t keep you from feeling the road, so no responsiveness is lost in the transaction. I’m seriously digging them, and I honestly have yet to talk to anyone who’s not. i love that color shoes… nice.. I have run a marathon on every continent plus a bunch more and about half the world in half ms in Brooks shoes (it helps they were founded in my hometown) and the new levitates maje my fwet amazingly happy. They are all that and more and I’m an (cough) older runner so that’s twice the compliment. Live my Brooks and really LOVE these new shoes. Amen. Can you fix the spelling in my comment. Sheesh.